I was surprised to see a Savage Republic video on Monday Morning Rock, as I had already planned on doing this record this week. This was purely coincidental and I apologize for the redundancy. 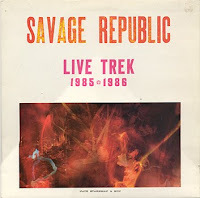 I do, however, believe that Savage Republic is a group that can be hard to appreciate with only a 3 minute video; so here is 75 minute live double lp! Traditionally, live albums have been shunned by critics for one reason or another. Lackluster sound quality, performances and song selection are often critiqued, and there is usually an issue concerning how much of the album is actually a live concert recording or overdubbed studio "correction." Hell, sometimes the integrity of the release itself is in question, with live albums often being released to fulfill some sort of contractual obligation that a band has with a record company. Claims like these were likely not made about this Savage Republic album due to it's lack of mainstream exposure, but I frequently find live albums to be an interesting, and, in some cases, integral, part of a band's catalog and I figured that now would be as good a time as any to share this view and maybe get some other people's opinions. Back to the matter at hand. L.A.'s Savage Republic had gone through a few line up changes and even a break up before embarking on the tour that produced this album. By this time, Bruce Licher and company were a six piece band that had developed quite a reputation as an intense live act, and these recordings do nothing to disprove that. A nice selection of material from both SR studio records is presented, though group had largely abandoned the industrial sound that was present on their debut, 1982's Tragic Figures, in favor of the tribal/eastern/Branca/noise/post-punk thing that they had going on 1985's Ceremonial lp and Trudge ep. This is not to say that they changed their sound altogether, by any means; they only made it a little less intentionally harsh. Live Trek holds the rare distinction of being a record that can serve as both a comprehensive introduction to a person unfamiliar with the artist and a great addition to the collection of someone that is already a fan. It may be a lot to take in all at once, but you will probably have realized how awesome this record several times before reaching the final track, 'Year of Exile,' which is a personal favorite of mine and one of the many highlights of this album.